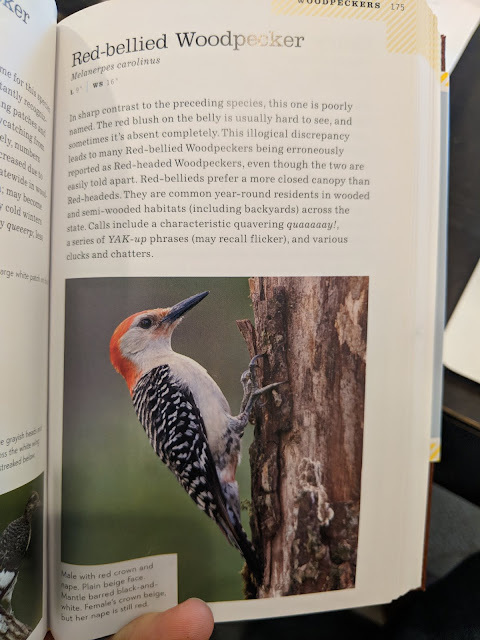 Just a few days ago, I posted a photo of the Illinois Bird Field Guide that Nat gave me for Christmas and today I can share that is already paying dividends! We had a visitor to our suet feeder that I was able to get that grainy photo you can see above. There's a screen up in that window and I didn't want to get too close for fear of scaring him away, so you're going to have to deal with the Zapruder film-version of my woodpecker. I snapped that photo before the bird flew off and then scurried over to my office to open up the field guide to figure out who it was. As you can see in the photo above, he has a red head, right? Yep. Red-bellied. Despite the head. Check out the description: "...this one is poorly named." ..."leads to many Red-bellied Woodpeckers being erroneously reported as Red-headed woodpeckers, even though the two are easily told apart." Compare my photo and this photo from the Field Guide. 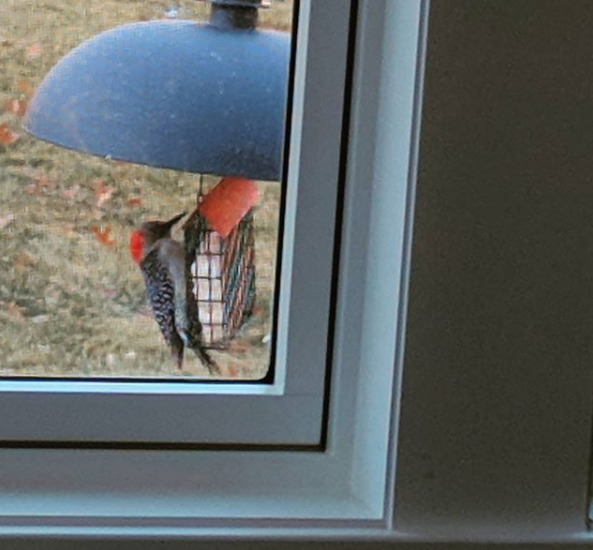 No doubt about it: we had a Red-bellied Woodpecker visit. Exciting times in the Parrillo household, folks! Exciting times.